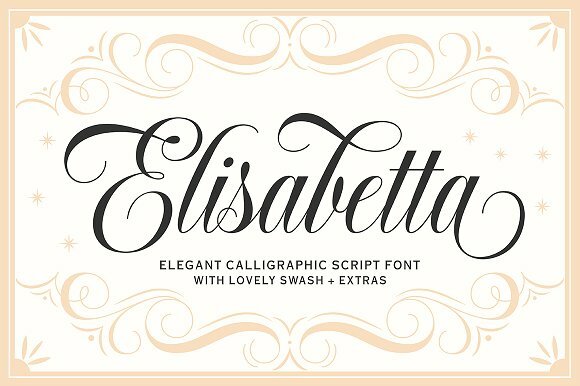 **Elisabetta** is a calligraphy script font that comes with lovely alternates character. a mixture of from copperplate calligraphy with handlettering style. Designed to convey style elegance. Elisabetta is attractive like a smooth, clean, feminine, sensual, glamorous, simple and highly legible typeface. Its classic style is perfect to be applied in any type of formal pieces such invitations, labels, menus, Logos, fashion, develop up, stationery, letterpress, romantic novels, magazines, books, greeting / wedding cards, packaging, labels. Elisabetta features 340+ glyphs and 160 alternative characters. including multiple language support. With OpenType features with stylistic alternates, ligatures and swash characters, that allows you to mix and match pairs of letters to fit your design, and also a touch of ornament makes this font spy elegant. A font description published on Monday, July 16th, 2018 in Fonts, Script by Andrei that has 1,950 views.